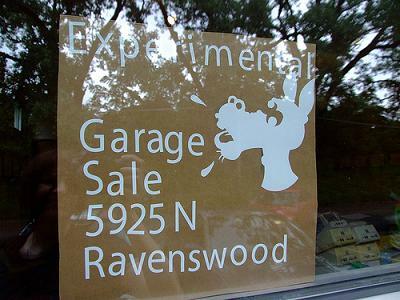 The Experimental Garage Sale was a smash success all across the board, so much that there is already talk about the next one. The Artists finally had a long and needed La Purga of gear. Their cherished musical instruments got new homes with other local and traveling Artists, ready to be utilized in new and unexpected ways. Initially there was a concern over the cloudy skies so the call was made to move sale inside the Experimental Sound Studio facilities, but that worked out even better thanks to the spacious Live Rooms and the AC kicking. The summer rain helped to cool off the outside and make for a perfect evening later on in the Windy City. In the first 2 hours the traffic was unbelievable, piles of unbent gear disappeared before our very eyes and intense negotiations were taking place for the bent stuff. In the end everybody was satisfied, leaving with piles of smiles. The sounds going on at once inside of the room were amazing and thanks to Nebulagirl we also have some recordings of that. Toys being tested, conversations, hustle and bustle all beautifully melted together. Click here to listen. More images from the event are also in the GetLoFi Gallery here and soon there should be video of Artists talking about their creations on Gearwire. Huge Thanks to the Experimental Sound Studio in Chicago for opening their facilities to us, contact them because they do recordings big and small! That and you will receive professional advice from the ever Experimental Alex Inglizian who was instrumental in making this event happen. Other gigantic Thanks go out to Roth Mobot Crew for being Chicago’s Finest, SpunkyToofers, Creme Dementia, NebulaGirl, Michael and Renee Una ( the New Chicago Prayer Wheel Project is rad ) , Kaz, Tim from Velva, WSAP, Brian, everyone that came to hang out, everyone that came to help support us in making of future art, and everyone wishing us good luck because they could not be there.